Gold and the Rush to get it! 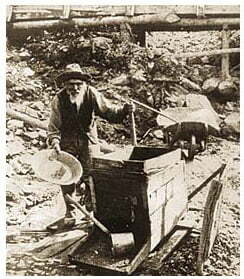 Three Yukon sourdoughs are generally credited with “The Discovery” in 1896 that launched the great Klondike Gold Rush! It all happened one sunny afternoon in August while George Carmack, Dawson Charlie and Skookum Jim were walking along Rabbit Creek, later renamed Bonanza Creek. Another version of the discovery has Mrs. Carmack making the find while doing George’s washing. Miners of those days endured much to “moile under the midnight sun”. Tools and equipment were rudimentary, much of it fashioned from local timber. There were no goods from “the outside” so miners packed their own. Once out in the goldfields, the choice was to work on open cut or the more popular method – go underground… in the winter! Sinking a shaft through the overburden to the pay gravels, the miners would dig, or drift, along the paystreaks, but first they had to thaw the permafrost, a laborious task accomplished with wood fires. sluicing. As better equipment arrived with improved transport into the territory, mining methods changed. In 1902 the use of steam thawing largely replaced thawing directly with wood fires. Steam was piped from surface boilers to steam points which were driven with wooden mallets into the working face. The depletion of high grade reserves roughly coincided with completion of the White Pass Railway from Skagway to Whitehorse and subsequent introduction of heavy machinery into the mining districts. Little underground mining occurred after 1904 and the independent miner virtually disappeared from the major creeks in 1905 with the arrival of the first bucket-line dredge. Dredging the stream valley floors and “hydraulicking” the bench deposits would be the principal means of mining and the mainstay of the Yukon economy for many years to come.